So I've meant to have this post live for quite a long time, but I kept putting it off as I really wanted to test it out. I actually bought the original Sleepyhead when I was pregnant as I saw it on a Instagram post and like anything that claims to aid sleep I wanted to try it just in case it did. Sleep with Wilf was SO awful, he woke up every 45minutes through the night until he was 18months old and Tom and I were like living zombies. I felt like actually we wouldn't have done anything particularly differently this time round and that Wilf was probably just the baby he was, but I did want to try to put Mabli down a little bit more as I would also need to tend to Wilf and not have the luxury of having a baby sleeping on me during the day as much. So, after buying the Sleepyhead Deluxe when pregnant I didn't actually try it out with Mabli until she was about four weeks old. I'm not sure what I was expecting but after she woke up after about 30 minutes I was too tired to settle her back into it and instead just let her settle on me in the night. I tend to feed my babies to sleep during the night and found it too hard to do this whilst she was in the Sleepyhead to after I tried it again a couple of times I gave up. Silly me! 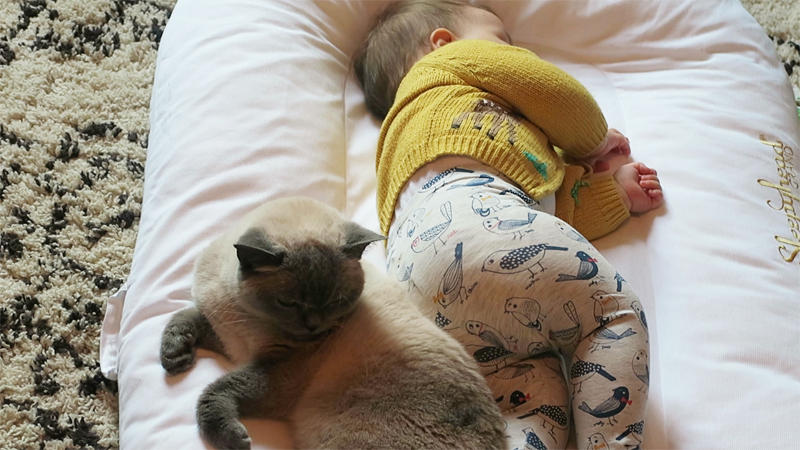 I discovered it knocking around the bedroom again when Mabli was about 4 months old and thought 'ok lets give this ago again' this time for nap times during the day rather than at night and I noticed a big change. As she was a bit bigger the Sleepyhead snuggled her a little bit more and she didn't notice the transfer from my arms after I had fed her and would sleep for a good hour or so. I used to put it in our Snuzpod which we'd also moved downstairs for naps and on the rare occasion when I'd managed to work out she was tired she even would settle in there awake (something Wilf had never ever done!). Mabli is quite a big baby so I decided to upgrade to the Sleepyhead Grand when she was around 8 months rather than 9 months as suggested. I passed the Sleepyhead Deluxe onto a friend but actually in hindsight I think I could have used it for a good couple of months more as the fact it was snug was something that helped her sleep in it. 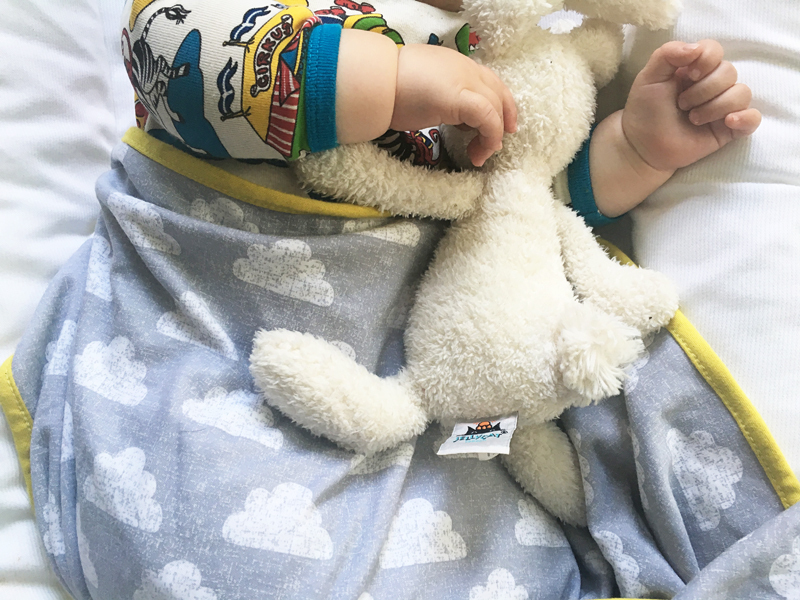 The Sleepyhead Grand is SO much bigger than the Deluxe but this is because its designed to go all the way to 36 months (so three years old!). I felt like if she got really used to this then it would be a great way to transition her into her own bed when the times comes. With both my children we've never actually used a cot and Wilf went into his own single bed in his room at 18 months. Again after a couple of tries I found I didn't get much use of it in our bed because of the issue with having to take her out to feed her. If I'm honest I've not really tried too hard to settle her back in it durning the night as she only wakes about once or twice now and will sleep really well just tucked up next to me and my thinking is 'if it's not broke don't fix it'. That being said she does use it in the evening from about 7.30 to 9.30. We've yet to leave her upstairs on her own, mainly because we've not got round to getting that organised yet as we're doing some house renovations and also because we've yet to get a baby monitor! Wilf was 9 months when we started leaving him in the evenings but again he was up every 45 minutes so it was pretty hard work. Mabli will now have a feed at 7.30, settle in the Sleepyhead and sleep in there downstairs with us until 9.30 when she comes to bed with us. I know to some people that might seem like an old set up but I think as a parent you just do whatever works. We feel like we're getting an evening to ourselves by watching a couple of episodes of a box set or catching up on work. I'm also using it for day time naps and once we've organised settling her upstairs I think this will be great for keeping on our bed during naps. We're in the process of updating Wilf's room and getting bunkbeds for when they eventually share so I might actually move the Sleepyhead onto the bottom bunk and let her nap in there. So my verdict would be, yes I think it does help aid sleep. I feel like I am able to settle Mabli and that she feels like she's being cuddled. That being said she is a very different baby from Wilf and tends to sleep better anyway. I do wish I'd tried it more than once or twice when she was a newborn but I'm very guilty of doing something a few times and writing it off! I'm glad I tried again at 4 months as we got a lot of use out of it after that. I feel like we use it enough for naps that it's worth having even though we don't use it at night and I feel like it will definitely help to transition her to sleeping on her own when the time comes. Obviously sleep is such a tricky topic with mums around the world. 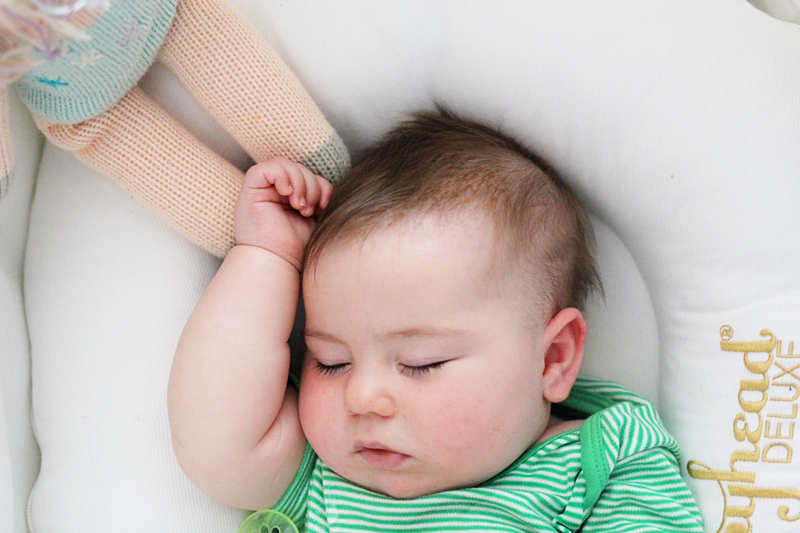 I don't think you could ever say a product will make your baby sleep but in my option the Sleepyhead is a really good aid. I hope that helps if you are making the decision on whether to buy one or not or whether to upgrade to the Grand! Oh but little Mabli is SO FLIPPING CUTE! Those shots of her cosying up in the Sleepyhead are to die for. This looks like a great little addition to the sleep arsenal of products. I thought I had every product going when Baby Girl was sleep-phobic but I missed this one. Maybe it would have helped! Oh Mabli!! What are you going to do when she gets bigger and loses the arm rolls?!? I don't know if I'll be able to stand it.